The popular Bottlefix now comes with its own KLICKfix quick-release feature. 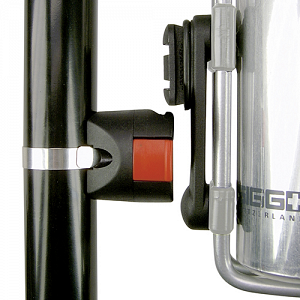 You can fix any bottle cage quickly on your bike and release it by pressing the red button. Can be used for all common bottle cages. Mini-adapter included. Easy to mount on stem, handlebar, seat post or frame using our Mini-adapter. With bottlefix you can mount any type of bottle holder on bikes without integrated frame threads (such as kids' bikes). We don‘t advise the use on carbon- or other lightweight seatposts or recommend to take advice from the manufacturer. Unifit Mounting: patented adapter mounting system with stainless steel strap.